Welcome to our guide to ferrets as pets! Thinking of introducing an unusual, fun pet into your home? Then a ferret might be just what you are looking for. Many of us have owned a cat or a dog at one point or another. Or given a loving home to a hamster, rabbit or guinea pigs. Others enjoy birds, fish, and reptiles. But it takes a special sort of person to welcome a ferret into their life. This unusual pet sure is cute, fun and entertaining. But it does require some special care that prospective owners will need to know all about before welcoming them into their homes. This article will help you decide whether a ferret is the right pet for you. Let’s take a look at ferrets as pets! Ferrets might look a lot like some of our favorite wild animals, weasels and stoats. But ferrets have actually been domesticated for thousands of years. They are not wild animals. Like cats and dogs, ferrets were bred for human companionship. And like cats and dogs, they can be great pets for those who have the time and resources to handle their individual needs. But before you jump into ferret ownership, it’s important to collect some information on these critters first. Chances are, if you’re thinking about getting a ferret as a pet, you were attracted to these animals by their cute, furry appearance. But the benefits of having a ferret pet go beyond their looks. Like cats, they have an independent nature. Like dogs, they are affectionate and love human interaction. For many, they may truly be a “best of both worlds” pet. In addition to their independent yet affectionate personalities, ferrets are also quite intelligent. They can learn to do tricks, recognize their names, and even respond to commands. They can also be trained to use a litter box – a great benefit for those who are weary of animal droppings around the home. One of the most commonly cited downsides to ferret ownership is their odor. Ferrets do have a musky odor that many find unpleasant. Unneutered male ferrets in particular have a strong odor. Because of the oils on their coats. Bathing your ferret occasionally can help with this. But your best bet to minimize smells is to feed your ferret a healthy diet, spay or neuter it, and make sure its living environment is clean. Female ferrets tend to have a far more pleasant and mild odor then their male counterparts, so if this concerns you then they might be the better choice. You will also find that even the smelliest ferret odor is something you will get used to very quickly. Although your visiting friends might notice it! As with any animal, keeping ferrets as pets can be a rewarding experience for both you and the animal. It only gets better when you truly understand your pet ferret’s needs. So what do these cute animals need? First and foremost, ferrets need a healthy diet. Being carnivores, they need a meaty diet full of protein. The best ferret food is high in protein and low in carbohydrates. You can buy special ferret food, but many owners also use high-protein cat food with similar results. The important thing is to make sure they’re getting plenty of protein with few grains. Raw feeding can also be a great way to manage your ferrets diet. Just make sure that they have a good variety of different meats and different parts of the animal. In addition to food, ferrets need a comfortable place to stay. They should have a large cage – or even a ferret-proofed room – to run and play. It should be equipped with toys, a litter box, and bedding to ensure that your ferret has a cozy spot to lay its head. Ferrets love climbing, and hammocks are a big hit. They are also big fans of tunnels. Some old pieces of drain piping provide hours of entertainment for them, as well as somewhere else to snuggle down. Although many people keep ferrets as house pets, you should not leave them out of the cage unsupervised. Like any other animal, annual vet visits are important for ferrets. The AFA suggests that these animals should be treated with canine distemper vaccinations. The organization also strongly recommends spaying or neutering your pet ferret. Under certain circumstances, an unspayed female ferret can die if it goes into heat regularly without being mated. Unneutered male ferrets emit a strong odor that is greatly minimized when they are neutered. Finally, future ferret owners need to consider the time commitment required to keep ferrets happy. They are lively animals that need lots of exercise. Either a very large run or to be allowed to run free in the house several hours each day. Those with a busy schedule may not have a lifestyle suited for pet ferrets. Ferrets are domesticated animals, so they are generally friendly to humans. They love being around their families and are usually affectionate. But just like any other animal, ferrets will bite when threatened. In some cases, the bites can be quite severe. The problem with ferret bites is that they can be very strong and given the way kids lift and cuddle their pets, these can be focused on their faces. We don’t necessarily agree with this statement. The American Ferret Association takes a less restrictive approach, simply recommending that children are taught how to properly handle ferrets. When tamed carefully your ferret should be gentle and easy to handle. As with any animal, it is a good idea to never leave a ferret alone with a young child. No matter how much you trust the animal, it is impossible to predict what may happen if they are provoked. It is possible to train your ferret not to bite. Gentle handling will also keep your ferret at ease, as will being consistent with how you approach training. If you continuously work with your ferret from the very first day you get it, you should be able to train it to be calm and affectionate. A ferret that knows to play and interact with these qualities will be much less prone to biting. A tame ferret that is confident in nature will be incredibly relaxed when handled. You can lift a tame sleeping ferret out of it’s bed and carry it around with it barely raising an eyelid. They are when tamed most tolerant and happy to be handled than most cats. Ferrets can play quite vigorously with each other, and might try to engage you in this manner of play. They will bounce up and down and chatter. This might look intimidating, but is not a threat. It’s an invitation to play. If you do not want to risk them getting over excited, ignore them while they bounce and if possible pop them back into their cage until they have calmed down. Just like any pet, the costs of owning a ferret can add up. Major pet stores in the United States currently list ferrets at around $150. But that is only the beginning cost. You will also need a cage, bedding, and toys. In addition, food, litter, and other recurring costs can add up to several hundred dollars a year. 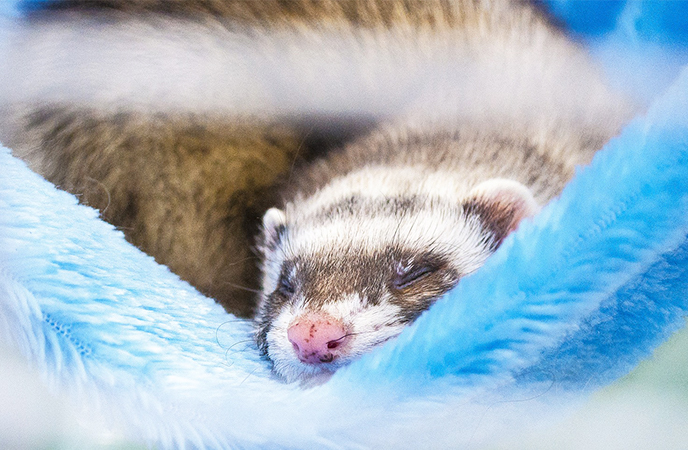 While many of the costs and care requirements are comparable to popular pets such as cats or dogs, ferrets are a unique animal whose needs should be considered before jumping in. If you love these friendly, intelligent critters – and you have the time and resources to devote to them – ferrets may be the perfect pet for you. Paisley, J W. 1988. “Severe Facial Injuries to Infants due to Unprovoked Attacks by Pet Ferrets” The JAMA Network.